Need an iPhone/iPad Hardware Reset? Fix It Now! Actually, some problems can be solved by simply doing a factory reset on your iPhone/iPad. If not, using a professional tool would be helpful. This is not reliable enough if a completely reset on iPhone is what you need, as data and files can be recovered and accessed easily. Hence, here’s the need for a reset tool. Before doing an iPhone/iPad hardware reset, you can try to reset the software first to see if hardware reset iPhone is necessary. There are many iOS reset tool out there, but only a few are reliable to use. The best so far is iMyFone Umate Pro for Windows or iMyFone Umate Pro for Mac . This is an iOS reset tool specially designed to fix iPhone/iPad and to protect personal data. It is also the best available reset tool in the market today considering what they do to idevices. They possess an advanced technology that reset data completely like a factory reset but safer and thorougher than simple reset, so you can use your iPhone or iPad as a brand new one. It can also prevent privacy leak by erasing your private data and files permanently with 0% chance of recoverability. Safe alternative for iPhone/iPad hardware reset by resetting it as brand new one. Preview and select data to erase: messages, call logs, contacts, browsing history, notes, photos, videos, etc. Even can find out your deleted data and erase them permanently. 3 resetting levels for different needs to reset iPhone completely. Step 1: A quick launch of the iMyFone Umate Pro on your PC and connect the device (iPhone) to the PC. Step 2: An active Connection is confirmed, click on Erase All Data on the left panel. Step 3: Click on Erase Button and type “delete” into the box to confirm. Step 4: After typing “delete” into the box, click on Erase Now. Once you have done this, you can fix your iPhone by reset it completely and make it as a brand new one without perform an iPhone hardware reset! If a professional reset tool is not your choice, you can still try to use iTunes to reset iPhone before doing an iPhone hardware reset. This is however similar to using a reset tool as there is a connection between an iPhone and a PC only that one would be working through iTunes. As far as iTunes is concerned, iPhone can be restored back to its original state but total data loss cannot be vouched for; you can backup files and data if you want to. Step 1: A Quick Launch on iTunes. Step 2: Click on the iPhone button on detection of iPhone by PC. Step 3: Click on Restore; iTunes then restores iPhone back to factory settings.. 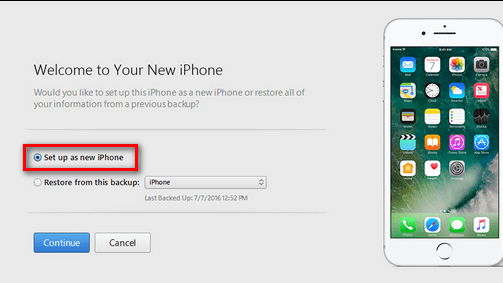 Step 4: iTunes will ask if you’re ready to restore you iPhone, and click “Restore”. Step 5: Choose “Set up as a new iPhone” to start fresh with factory settings. Part 3. Hardware Reset iPhone? Using iPhone Directly. This is somewhat easy but not dependable as data and files from phone can be recovered easily even after doing factory reset. It is easy in such a way that you wouldn’t need making connections to a PC; just your device is enough to do the reset. Step 1: Click on Settings > General > Reset. Step 2: Click on Erase All Content and Settings. Step 3: Enter your Passcode or Apple ID. Step 4: Tap Erase iPhone to confirm your choice to erase data. You can know more about reset settings on iPhone here: Reset Settings on iPhone . In summary, this article clearly explains the various ways in which you can reset iPhone before you doing an iPhone hardware reset and make sure your device is safe and private. You don’t have to worry about iPhone hardware reset again because we got you covered with iMyFone Umate Pro Data Eraser that ensures data and files are not recoverable when deleted.